We are Together: Sharing observations from the 55th Session on the Commission on the Status of Women! During the first week of March, I had the opportunity to attend part of the 55th Session of the Commission on the Status of Women (CSW) organized by the United Nations at its headquarters in New York. This year’s CSW session, focusing strategically on “Gender, Education, Science and Technology, and Employment,” was special as it coincided with the historic launch of The UN Women—created from the amalgamation of the various gender units of the United Nations. The UN Women has a strong foundation from which to build, drawing from the lessons learned by the various gender units that have now combined to create the new collective approach for addressing women’s rights and empowerment. Thankfully, the organization’s focus on connecting with grassroots women already is a positive sign for engaging and amplifying the voices of women and girls who for long have been invisible and marginalized in the mainstream women’s movement. It is exciting to know that UN Women will draw from multiple talents from diverse backgrounds to accomplish its mandate. The Commission’s strong focus on youth is a key, as youth leadership is crucial to designing innovative solutions to the world’s challenges. Young women and men who are part of networks such as the Moremi Initiative, an organization with the vision to engage, inspire and equip the next generation of women leaders and Young Women’s Knowledge and Leadership Institute (YOWLI) showcased the leadership potential and on-going creative solutions being generated by youth for social change, at the CSW event. Sitting in the various spaces where these dialogues and sessions occurred, I felt not only a glimpse of hope, but also gratitude for the abundance of resources not in the traditional sense of money, but in the potential for what strategic engagement and investment in youth could contribute to addressing the world’s challenges in a holistic and equitable manner. Being part of an organization that is filling in the gaps and making linkages between women and the environment via innovative solutions to food, land, water and climate justice, it was invigorating to see the urgency the CSW created around addressing the impact of climate change, particularly as it affects women. Several panels and sessions focused on creating integrated solutions and resilience to this issue, and in the African context, it was groundbreaking to see grassroots women leaders and groups as well as youth from Uganda, the Gambia, Rwanda, Sierra Leone, Madagascar, Namibia and Kenya, sharing their stories of how they are mitigating the impact of climate change. At the same time as the CSW program, Groots International/Huairou Commission organized an extended session on leadership training for grassroots women globally, who are working directly at the intersection of gender and the environment. I made some personal and important connections at CSW that will allow for a deeper engagement with networks and organizations on the ground in Africa to ensure economic and environmental security for women. These connections along with Women’s Earth Alliance’s core programs in capacity building, communication and advocacy will strengthen our work in Africa and contribute to making meaningful and sustainable changes in the lives of women and girls on the continent and in the diaspora. They will also inform our partnership model based on mutual respect for local knowledge and expertise, peer learning, and the ability to prioritize the most marginalized groups, as we equip them with various skills and resources and facilitate the space for them to set the agenda and design innovative women led solutions to environmental challenges. I believe that on this journey to ensure women’s livelihoods and environmental justice, we work, sing, dance and fight together and never alone. While Japan reels from tsunami and an escalating nuclear catastrophe, the Obama administration last week affirmed its commitment to nuclear power’s role in our national “clean energy” portfolio. Our leaders can’t account for the safety of our 104 domestic nuclear power plants in a major earthquake, the national security risks of nuclear proliferation for energy, or the nuclearwaste disposal conundrum. Nonetheless, uranium mining and the development of new nuclear power facilities continues apace. Women are raising their voices to demand safe energy. Renowned activists like Helen Caldicott and Joanna Macy, along with scores of concerned women at the grassroots, denounce nuclear energy as a dangerous and foolhardy enterprise from its cradle – the environmental and public health damage wrought by uranium mining, to its grave – the unsolvable problem of radioactive waste disposal. These leaders call attention to the unique and often disproportionate health impacts borne by women, children and fetuses from nuclear radiation. They describe the outrageous risks of nuclear energy as an intentional or accidental weapon of war. And they share a vision for a nuclear-free U.S. energy portfolio. Indigenous women, particularly, stand at the front-lines of the nuclear energy debates, with their lives and the lives of their families and communities threatened by uranium mining. Southwestern tribal peoples such as Navajo, Havasupai and Western Shoshone suffer the egregious impacts of uranium extraction on water, land, and health – especially because of the relative lack of federal protection for tribal natural resources and public health in the face of the uranium boom. 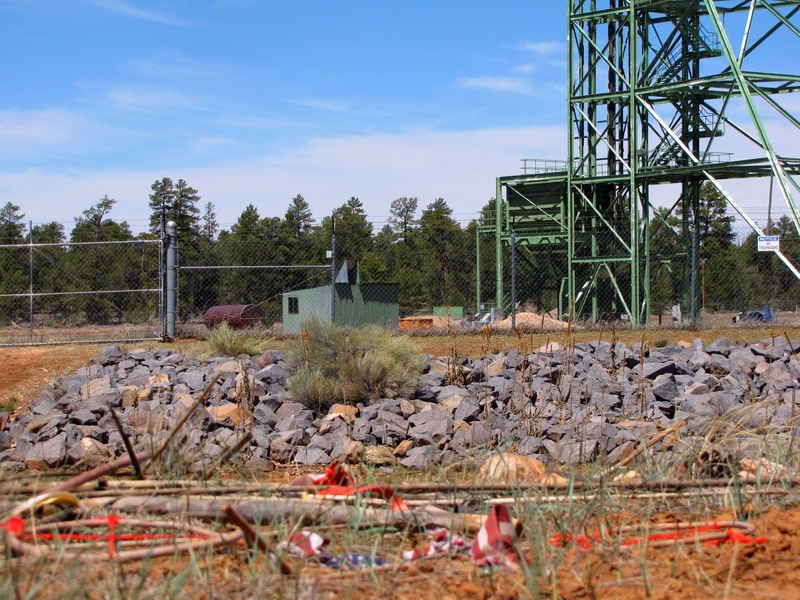 In some Navajo communities, for example, one person on average from each family – thousands of people, overall – has died from health issues related to uranium exposure in the mines. The largest nuclear spill in U.S. history took place on the Navajo Nation, at Rio Puerco in 1979 – and yet the federal government recently authorized the reinitiation of mining activities at that very site. Lands surrounding the Grand Canyon are uranium-rich and targeted for mining – threatening the water sources and lives of Havasupai peoples who live downstream from many of the proposed mines. But women like Carletta Tilousi (Havasupai), Anna Rondon (Navajo), and Winona LaDuke (Anishinaabe) speak out about the dangers of nuclear energy to their peoples’ bodies and sacred lands. These courageous women are part of a larger movement of Indigenous leaders articulating a powerful vision for a carbon-free, nuclear-free future. Tribal lands, currently exploited for coal, oil, gas and uranium, are replete with renewable energy resources – it is said that the entirety of the Southwestern U.S.’ solar energy potential could power the entire U.S. electricity grid. WEA’s Advocacy Network stands in solidarity with Indigenous women environmental leaders, providing critical technical expertise to support the realization of their visions for a sustainable, balanced, just energy portfolio. Tribal lands, presently exploited as “energy colonies,” can lead by example towards a renewable energy-powered future. The crisis in Japan calls us to move towards a stable, life-protecting energy portfolio – fortunately, Indigenous women leaders are offering us all a map to this powerful, necessary path. 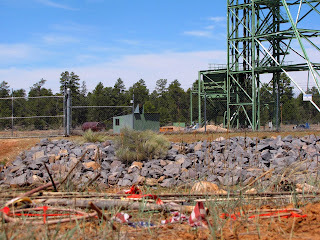 Photo: Havasupai prayer items at uranium mine near Red Butte in Northern Arizona. The Africa Program and the Global Women's Water Initiative are fired up and diligently preparing for our upcoming Women and Water trainings in Uganda. We will be hosting two trainings in July: a Grassroots Women's Training and an Advanced Trainer's Training. The Advanced Trainer's Training will include GWWI Trainers and graduates from our past trainings along with Global Fellows who are preparing for a future in international development. The participants of the Advanced Trainer's Training will have the opportunity to support the incoming Grassroots Teams and help them design and implement their projects in their communities. Today marks the 100-year anniversary of International Women’s Day. With ripples of change created by powerful movements world wide, our global community has come far since 1911. And, there is still a long way to go. 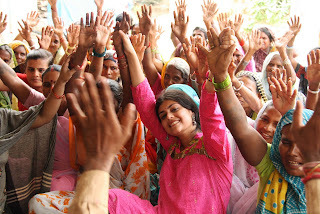 The UN recently recognized that “longstanding inequalities in the distribution of resources have placed women at a disadvantage in participating in and benefitting from development processes.” This is despite significant research that places women’s empowerment as a necessary condition for healthy, politically stable, economically sound, and environmentally safe societies. This is why we created the Women’s Earth Alliance (WEA) – an organization that creates innovative solutions to issues of water, food, land and climate through collaborative initiatives that train, connect, and empower emerging women leaders. 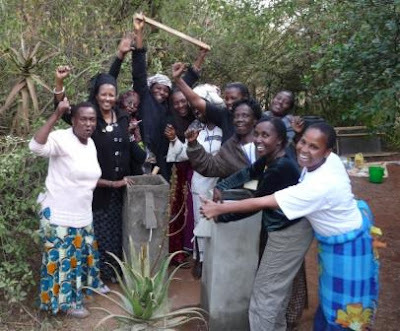 Here's the kind of change our programs create on a regular basis in the regions where we work: Lucy Mulenkei was a 2008 Global Women’s Water Initiative Training participant. Lucy's home is in Northern Kenya, a drought-prone region experiencing the acute effects of climate change. Lucy took her rainwater harvesting, WASH education, water testing, and solar pasteurization skills straight to her community, where she organized women's groups to launch tree planting projects, built rainwater harvesting systems, and created safe water supply for her community of 25,000 people. Every skill Lucy learned was multiplied by the dozens of other people she trained. In December, Lucy was even featured in Newsweek Magazine for her environmental leadership, alongside WEA allies Dr. Wangari Maathai and Vandana Shiva. This is the ripple effect in action. Over the last 5 years, WEA’s Africa Program has forged partnerships with 30 community-based organizations across 11 African nations providing water technology training, economic development, and seed capital to many African communities through the Global Women’s Water Initiative. Our North America Program mobilizes support for the environmental justice campaigns of our 12 Native American partner organizations through WEA's Advocacy Network of legal, policy and business experts. Our newest India Program will provide funding and training on rights education, ecological farming and appropriate technology to grassroots Indian women leaders to improve food and economic security of local communities, preserve the environment and traditional knowledge systems, and build political will. 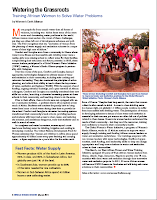 • Women are water harvesters; but are not consulted about water projects. Women and children in Africa alone spend approximately 40 billion hours every year fetching and carrying water –Yet they are rarely consulted during the implementation of ‘improved water projects’ in their communities, resulting in outside technologies that are not designed to meet their needs. • Women are significant food producers, yet they struggle to access land. Women are the stewards of natural resources, and major participants in global agriculture production, yet only 1% of the world’s women own land and less than 5% of women receive farming extension training. Addressing these issues is a matter of survival, yet for decades traditional development programs have invested billions of dollars trying to “fix” these problems often without consulting women, the core stakeholders in communities. This has led to years of failed projects. Although women are cited as “target beneficiaries” women’s critical contributions to food security, water access, and community health, is overlooked. WEA’s collaborative work addresses these issues through partnership and listening, and is innovating new models for community development that are based on an investment in women. When trained, connected and empowered, women become positioned to guide the development of their communities away from degradation and dependency on outside international aid institutions towards self-reliance. On this day, we are honored to be another ripple in the legacy of women and courageous men who have been making waves and turning the tide toward a world we are proud to leave for future generations. Stay tuned in the coming months for stories of hope from inspiring women attending WEA training programs in Africa, India and North America. More people die from unsafe water than all forms of violence, including war. Africa faces some of the most acute and devastating water problems in the world. African women must endure the worst of these challenges, yet they are often left out of development schemes and policies. The FAO recognizes that the "exclusion of women from the planning of water supply and sanitation schemes is a major cause of their high rate of failure." 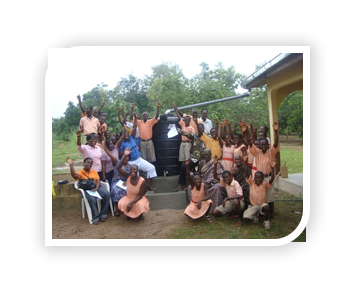 Click here to read the story of Comfort and Georgina who are changing rural water and sanitation in their Ghanaian community. 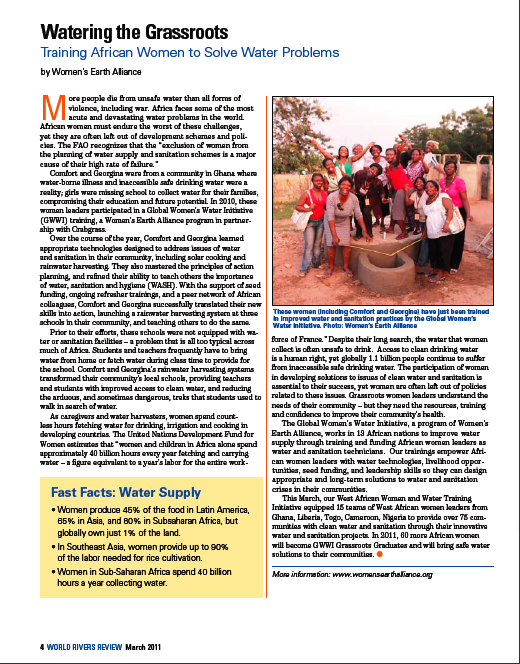 The Global Women’s Water Initiative 2010 training in Ghana proudly reports the ongoing impact of its graduates. Mrs. Akofa Akakpo and Ms. Sénadé Mattia GUIDIHOUN of Togo, West Africa, have successfully implemented and constructed a clean and readily available water source in the village of Kpogardzi at Kpalime! Taking the skills and lessons learned from the Ghana training, Mattia and Akofa assisted GWWI trainer Monica Ayomah to coordinate and conduct a refresher training in Ghana with their fellow training participants Comfort and Georgina, where they constructed a rainwater harvesting system at a school, further boosting their confidence to build a system on their own. When they returned home, the two women visited their site for initial preparation of the project and with the the help of local NGO, JVE Kpalime, Akofa and Mattia surveyed local people and gained the support and involvement of local officials in Kpalime. During this site visit, it became apparent that water, hygiene, and sanitation were not, at the time, integrated into the routines and customs of the people. Water tests, conducted with the help of local women, showed a prevalence of E. coli and a general poor state of the village’’s water supply. With this knowledge and the support of the village, subsequent plans were made to build a rainwater harvesting site at the local school, which did not have a water source. 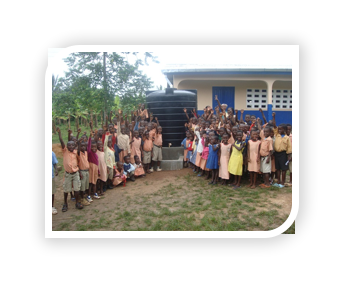 Akofa and Mattia returned to the village in early December 2010, and after three days of construction and implementation of the water source, the official handover ceremony took place. On 10 December 2010, the rainwater collection system was presented to the village. The presence of the Development Chief, Mayor and other local officials, school staff and students, and local people from the neighborhood, proves the wide impact of such a project. The ongoing support of JVE Kpalime in monitoring the site, and the committed support of all levels of stakeholders, gives great hope for the sustainability of this much-needed water source. The hard work and dedication of Akofa and Mattia will be felt in this village for years to come! EarthDance Film Festival Benefits WEA! 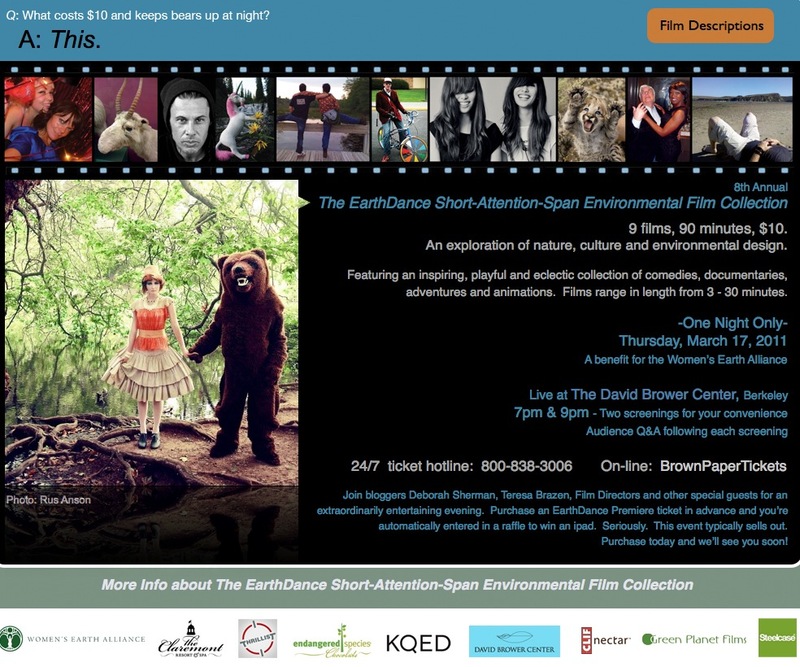 WEA is honored to be the beneficiary of the 8th Annual Short-Attention-Span Environmental Film Festival March 17th at 7 and 9 pm in the David Brower Center for an evening of entertainment benefiting our work and showcasing nine inspiring, environmentally-themed short films. A Q&A session will follow both screenings. Please click here for ticketing and more information. We look forward to seeing you there! Hosted by EarthDance Films.